The dreaming and planning has finally turned into reality – I’m on the freakin Appalahian Trail! A little over a week ago Connor, my hiking partner/boyfriend, and I were nervously sitting at SFO waiting for our plane to Atlanta. The flight across the United States into the mysterious land that I had never stepped foot in, Appalachia, was exhilarating. “A Whole New World” from Alladin was playing in my head each time I peaked out the window. I couldn’t be more thankful for the team and Hiker Hostel for the transportation from the Atlanta Airport to the hostel, and then to the trail. The process was seamless and our driver talked the entire ride to Springer, so I had no time to think about the knots in my stomach from the nerves. And then it happened… I was staring down at the Appalachian Trail plaque. We snapped some photos, posted to Instagram then we were on our way to the first camp at Hawk Mountain. To calm the nerves I tricked my mind into thinking, “it’s just a casual walk in the woods. No biggie” so I didn’t have to come to the realization that this is the beginning of 2190 miles. I know I know, my brain works funny. There were around 15 hikers at the first shelter. Connor and I decided we didn’t want to sleep in the shelter, and then so did everybody else. The only person in the shelter that night was a section hiker, and he actually pitched his tent in the shelter. Us thru-hikers got quite a giggle out of that. That night, we sat around the fire talking with other thru-hikers about gear, bears, and our back stories. Little did I know, that night would spark lasting friendships. 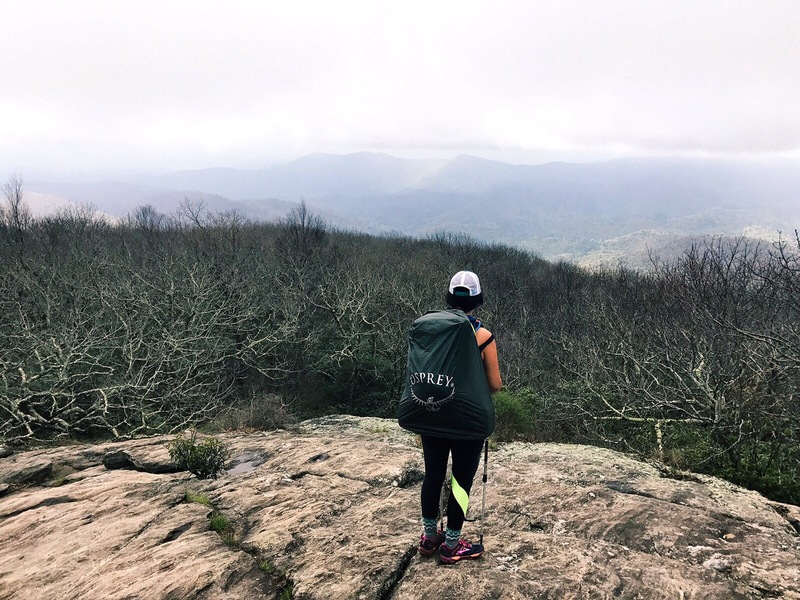 I was a little worried about Blood Mountain mainly because of the name… But also because a lot of my trail family was working it up to be something similar to Mt Everest. Blood Mountain was… Well, easy. Half way up Blood Mountain I asked Connor, “so when are we going to start blood Mountain?”. Yeah I know, so anticlimactic. The worst part about the mountain was coming down hill. It felt never ending. At the bottom of Blood Mountain was Neels Gap. I had heard from a Appalachian Trail 2017 Facebook group that the Noro Virus going around, but that was a month ago. Noro Virus can’t linger that long, I thought stupidly. Well, that was the beginning of a very long night of rain, throwing up, and diarrhea. Connor , myself, and our friend Wild Spirit had the virus. We had decided that it was necessary to take a Nero at Blood Mountains Cabins. Lucky for us, we were only 1 long torturous mile back to cabins where we could seek haven. Blood Mountain was surely the least of our worries that day. 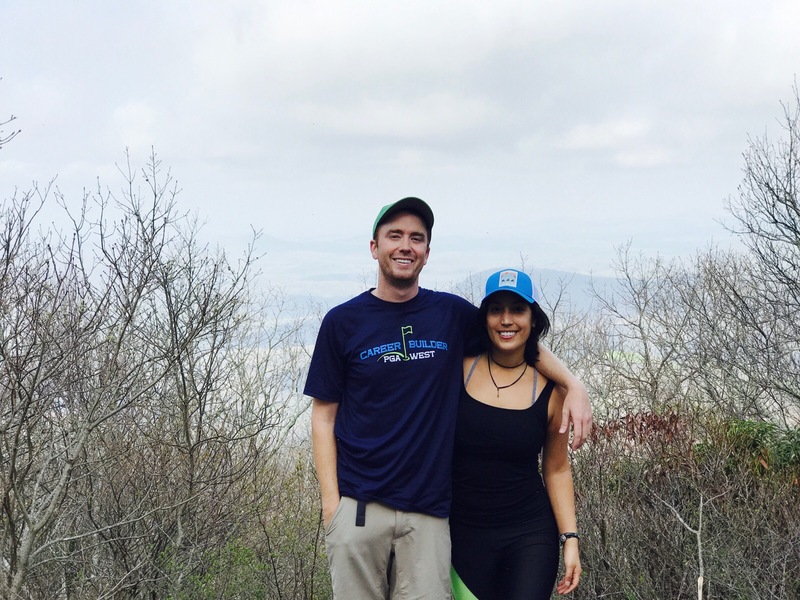 We were happy to get back on the trail and start heading to our next goal: Helen, Georgia. We hitched to Helen from Unicoi Gap. Connor and I stood at the side of the road, put out our thumbs and smiled big. But not creepy big. We must have looked like a trusting couple, because the first car swerved (yes, swerved) over for us. We were on our way to Helen faster than we had expected! We can only hope that hitching will always be this easy for us! On our way headed to Cheese Factory Camp we had decided to take a quick snack break. Connor scouted a nice spot and I walked away to find a tree. 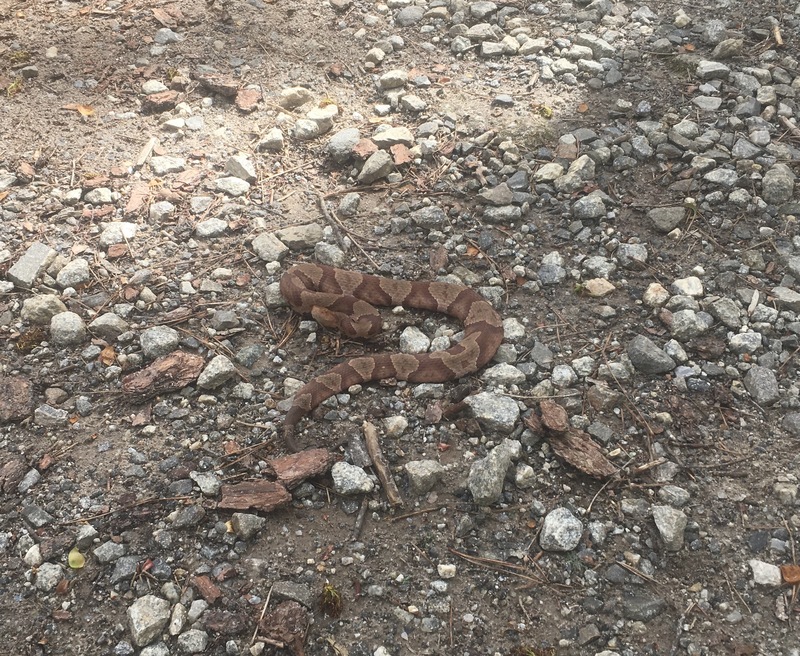 I heard him start yelling, and he had turned around behind his seat to see a copperhead! The snake was beautiful, and was definitely scared to see us. We decided to take a Nero in Hiawasee to avoid the storm. We shared a room with our new friend Wild Spirit. That night was my favorite day being “on trail”. Relationships between our tramily grew deeper. But also, I finally got to see how the basic things in life, like grocery shopping, turn into pleasures while on this journey. The trail has been treating Connor and I well. The first week on the trail has reminded me of my first week of college. Everyone is nice, trying to make friends, and hoping to gain real relationships. Similar to college, we’re all working towards one main goal – to get to Katahdin. -I don’t have a trail name yet, but I’m hoping that will change soon.